If you've ever had a conversation about the potential for media fakery in live TV broadcasts, one only has to point to the NFL games.They've been doing it for years with first down markers. 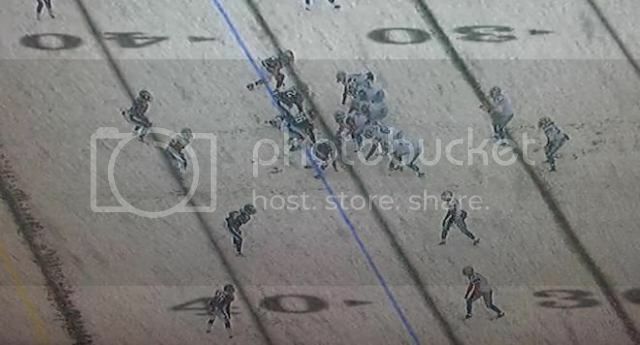 Now Fox has unveiled its latest technology in the Eagles and Lions game in Philadelphia where there was up to 8 inches of snow on the field. Fox is periodically superimposing the field markings (including the yard numbers) over the snow. It’s creating the impression that the lines — and the numbers — actually have been scraped of snow. It's not perfect but it does make me wonder what else the networks and perhaps DARPA might have up their sleeves. Media fakery can come in handy when trying to sell a scenario. Digital TV makes it easier than ever before. I don't want to get too carried away here, we have always had major storms of all types, but when it comes to the subject of geo-engineering the MSM is basically silent. Even some of the major 'alternative' sites are not prone to delve into it. There has been a deluge of articles all over lately that are critical of 'conspiracy theories' but they rarely add weather modification into their mix of 'kooky' ideas. We only have to look back to the 1996 military research paper Weather as a Force Multiplier: Owning the Weather in 2025 to see that some take geo-engineering seriously. We also know that if the government/military is going to develop destructive technologies, they have to test them. Nuclear weapons are a classic example. The US has a history of testing things on their own citizens without their permission Do we really think this has ever ended? It's quite possible it has only gotten more intense. Why?...because they can. My own observations of local chemtrails over the years are being backed up by others in various places. They occur within 1 to 3 days before a general rain. A couple of weeks ago, in the middle of the week when flight patterns out of Nashville are nearly identical, we had two days of nearly the same weather, temperature wise, and very little cloud coverage. The first day there were a few contrails and they dissipated quickly. The next day the skies were a checkerboard of trails with some big X's for good measure that slowly spread out. 2 days later it rained. 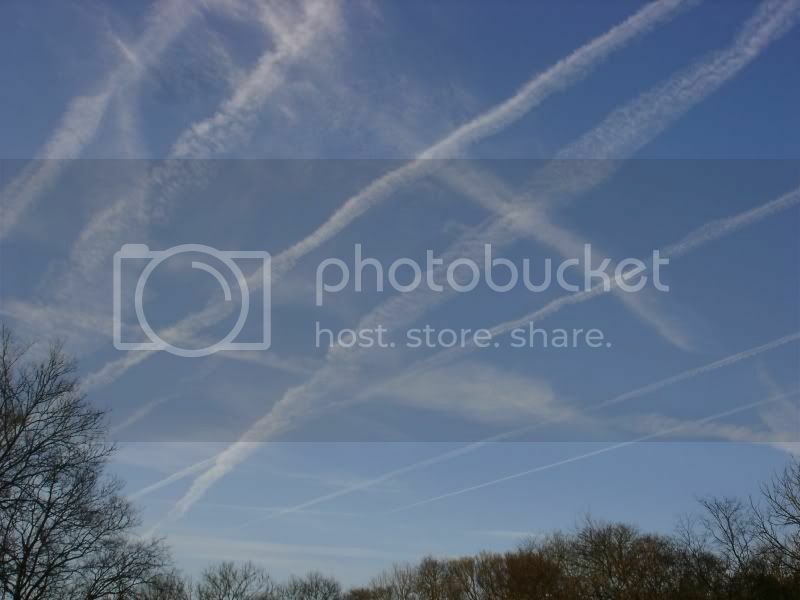 If push ever comes to shove, the official back story for chemtrails will be that they are to prevent global warming, to try and save the planet, it's for our own good and the program had to be kept secret just because we might not understand. I don't know a whole lot about chemtrails or anything else for that matter. You can call me crazy but I think something's up...in the sky...and it ain't good. A photo from my front yard a few years back. It's typical and although sporadic, it is never ending. I came across this website awhile back. Its updated frequently and I have no idea who maintains it. I can't vouch for anything personally but I also can't vouch for why there are so many streaks in the sky on certain days. It is interesting anyway. Looking through that website I would have to add very strange to the interesting part. Some aspects I can see, nano-threads in chemtrails is one and for some sort of mind control another. Others, not so much. The part that threw me off was the "Why" on this page. If I'm going to go way deep down the rabbit hole, I'll add the idea of chemtrails and geo-engineering as an alien technology modified for use today. There are parallels in the Sitchin translations and interpretation of Sumerian writings where the Anunnaki were using the gold they mined on earth to spray into their atmosphere to keep their planet liveable.and to the spraying going on here today, although probably for different reasons. Depopulation may be one reason. Whatever the purpose of geo-engineering, I'm open to theories but I'm not hanging my hat on any particular one at this moment except that it is not in our (the masses) best interest. For a long time now, I've been a weather geek, always looking at weather patterns and temps from around the world. This bone-chilling cold the Midwest has been getting is usually the kind of weather seen in western Russia and the Ukraine, which is having rather mild weather for this time of year. So call me a conspiracy theorist, but it's very possible that the New York-London banksters are having their minions make the weather outside delightful... for a revolution in the Ukraine, while sending the Arctic Express to the USA. If they succeed in taking in the Ukraine, the banksters will loot that nation like they're doing to Greece, Portugal, Spain, Ireland, Cyprus, while slowly strangling the rest of the Western world. Could be Greg. What we used to call science fiction may just be science, as nefarious as it might be. If if is true (as it appeared to be at one time) that the Rothschilds bought up at least two of the primary weather forecasting channels (Weather Channel and Weather Underground), does this mimic or parallel the filming of the Kennedy hit by Zapruder, the filming of the WTC attacks, or the act of flying in on September 10th to take a Manhattan penthouse with a view -- as noted in a recent James Corbett podcast by Galen Mitryzk of 911JusticeCampaign.org -- so that the satanic capitalists can watch the weather and see how to hedge their financial bets? 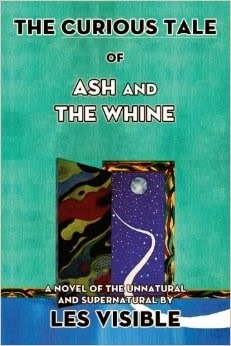 Ever read the book "The Illustrious Dead" by Stephen Talty? Doesn't weather modification work hand in hand with bio-chemical warfare? Your question at 911jJustice on the Rothschild viewing of 9/11 is an old one. I don't doubt it but I don't think anyone has found proof, If you run across it, please let us know. My next piece, almost ready to go, is about chemtrails from Topham's chemtrail site. In my links are lists of the toxins, the patents, everything and more you did not want to know about America''s plans to "own the weather" by 2015. The impatiens plant has almost died off here in BC due to the excessive fungi taking hold in our forests and gardens thanks to these planes from both the US and the Comox Valley (on the Island). You are familiar with Arthur Topham, I imagine. Here is his site on chemtrails i n BC. Pretty astonishing especially the latest piece. Make the lie big, keep it simple and repeat it over and over. Hmmmm, what could be bigger and more simple? No, those lines criss-crossing the sky, the ones that are all over the world in almost every country on the planet are really not there. It's just your imagination. After all, if it was real the politicians would be concerned and the media would be reporting on it. Thanks, I'll try and get around to seeing these soon. I did recently watch Smallstorm's video on Sandy Hook . Yeah, saw that one. Really like her. Very unique to have someone so articulate, intelligent and well-spoken, and prolific on such a diverse number of subjects. Ditto that, and thanks Gary; I've been meaning to watch these. After watching those video's I am reminded what I learned at the end of season 2, Walking Dead. I just checked myself for lesions again. Israel created as a "state".....1947-48. Thought this amazing piece of truth by Ken O'Keefe would've went almost viral, but the 'alternative' news sites are avoiding it like it was the plague. Wonder why? Then watch what Mister O'Keefe says about the banksters and their flunkies. O'Keefe is one of the best straight up speakers out there. Getting ignored means he is right over the target. This was disgusting. The puppets make their appearance at the cabal memorial. Check the photos, they tell the story. "Looking at the individual AFP and Instagram shots, you would have no idea that Obama and Bush traveled to South Africa together on Air Force One. ... or that Bush dazzled Michelle Obama and a smiling Hillary Clinton with photos of his recent paintings. ... or that the Bushes and Clintons spent the day together at FNB Stadium. it's time that we acknowledge that conservative and liberal politicians spend more time together, and have more in common with one another, than we’d like to believe." Also notice that Jimmy Carter didn't take the ride with them or even sit with them at the stadium. Carter was CFR and had Brzezinski as his National Security Advisor but he didn't always stick to the script and had to go. The Fed raising interest rates to the highest level in our lifetime and HW's deal with the Iranians to hold the hostages until after the election done him in against Reagan. The Cabal had their more compliant pawns in place and never looked back.